These lightweight, compact headphones boast circuitry that effectively reduces distracting background noise by 90% while offering the superior audio quality that has made Audio-Technica a worldwide leader in electro-acoustic technology.Arrive refreshed after a long flight, avoid distractions in a noisy office, or find peace and quiet in your living room with ATH-ANC7b QuietPoint Active Noise-Cancelling Headphones. Arrive refreshed after a long flight, avoid distractions in a noisy office, or find peace and quiet in your living room with ATH-ANC7b QuietPoint Active Noise-Cancelling Headphones. Effectively reduces distracting background noise by 90%. Includes 1/4-inch and airline adapters and carry case. These lightweight, compact headphones boast circuitry that effectively reduces distracting background noise by 90% while offering the superior audio quality that has made Audio-Technica a worldwide leader in electro-acoustic technology. 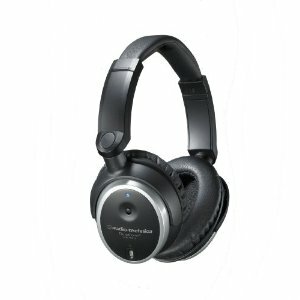 Ideal for use with MP3, CD, DVD and in-flight entertainment systems, ATH-ANC7b QuietPoint closed-back headphones deliver clear, high-resolution sound, with impactful bass, a detailed midrange, extended treble and accurate imaging in an immersive soundfield. Their earcups have been redesigned for greater comfort, with generously cushioned padding and a shape that fits easily over any ear. The ATH-ANC7b QuietPoint headphones feature large-aperture 40 mm drivers with neodymium magnet systems and extremely high 109dB sensitivity to provide generous volume levels from any music source. 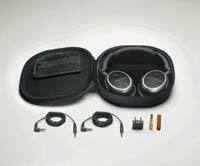 The headphones also work when the noise-cancelling function is turned off, and operate in passive mode without batteries. 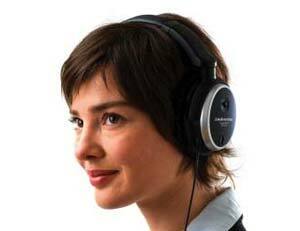 Noise-cancelling electronics are fully integrated in each earpiece, with no need for external modules. These headphones feature a lightweight, compact, fold-flat design is ideal for travel--in fact, a specialized airline adapter for connecting to in-flight entertainment systems is included, along with a handy carrying case.